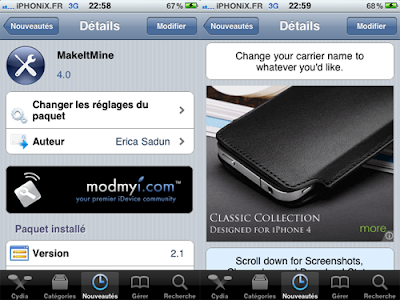 MakeItMine is a free tweak available on ModMyi. This tweak will permit you to customize in one shot the name of your carrier or replace the time in your Statusbar by a custom name! Compability : OS x3,iOS 4x,iPhone 4. Carrier : change the nom of your carrier or iPod. Banner : change the nom where you can read the time. Let the space empty to go back to default text, apply and respring.